Colavita, one of the leading names in Italian cuisine ingredients, has put together this amazing sampler of some of their best products. All packaged in a great tote bag that makes a fantastic reusable shopping bag. And guess what? We’re giving one away! That’s right! One lucky Knife Cork and Spoon reader will win the collection of Colavita items above, valued at $59! Now that you’ve entered here, check out the other fab giveaways! The Colavita family still operates out of the same town they started in as 2 separate businesses. I really like Colavita's selection of oils and vinegars. 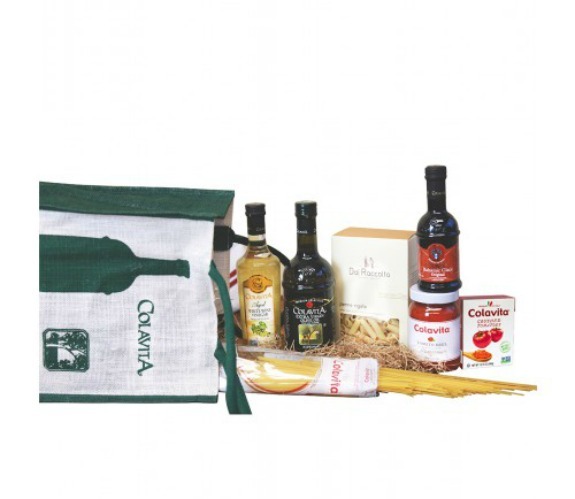 I learned that Colavita have other products in addition to olive oil. We use Colavita products regularly. I like the recipes they have especially would like to try making the TOMATO ORANGE CHICKEN MEATBALLS.